Is the email really from who it says it’s from? Have you ever opened an email that said it’s from a company you are familiar with and noticed that the body looks suspicious? Or it tells you to click on a link because they need some of your personal information otherwise you’ll lose your house, or your bank account will be frozen, or aliens will come down and take you away? More than likely it’s not from who it says its from, rather it’s from someone trying to scam you. But it’s not always that easy to tell that it’s fake. For instance, take a look at the below image. It looks like it might come from Costco. 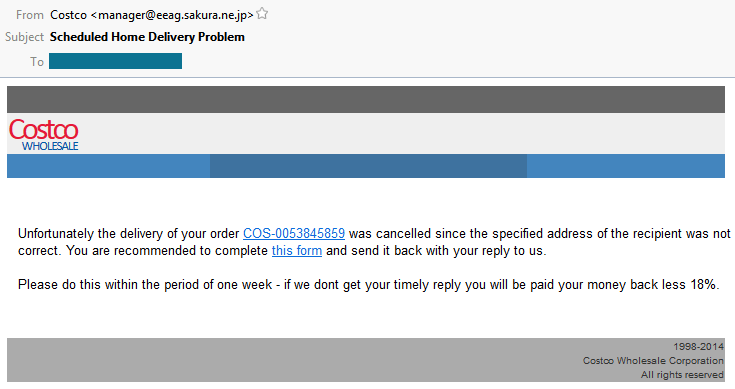 However, if you didn’t order anything from Costco and you receive this email, it’s probably a scam. In this next example, you might be tempted to click on the link to find out which of your friends passed away. The email looks like it could come from the funeral home, but if you’ve never received one from them, you won’t know what their emails look like. There are a few ways you can find out if these emails are really from the people they say they’re from. First, look at the sender’s email address. 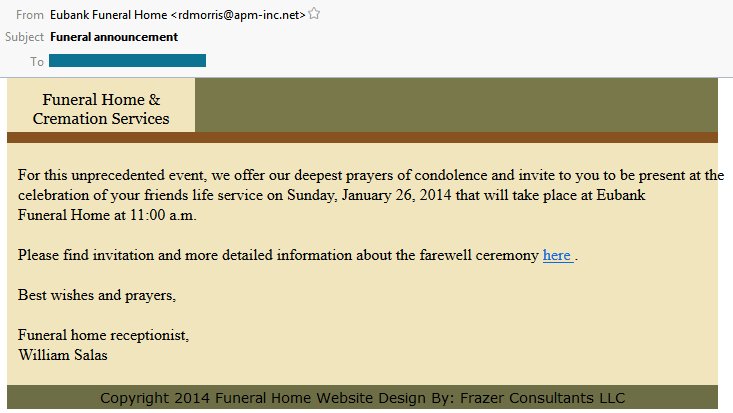 In the below funeral home example, it says it’s from Eubank Funeral Home, and comes from the email address “rdmorris@apm-inc.net”. The first red flag is that the last part of the email address, the part after the @ symbol, doesn’t match the name of the funeral home. If you open your internet browser (Firefox, Chrome, Safari, etc.) and type in apm-inc.net, it opens the Allensville Planing Mill website. And if you search for “Eubank Funeral Home,” it will bring up the funeral home’s actual website, www.eubankfh.com. If you do receive a spam email, make sure you mark it as spam. If you use Microsoft Outlook for your emails, here are the steps to take to mark an email as spam. First, make sure the email is highlighted and right click on it. In the pop-up window (see below image) drag your cursor over “Junk E-mail” and when the new window pops up, click on “Add Sender to Blocked Senders List”. If you use Gmail, you can find out who an email is coming from without having to open it. In the below image, the email says it’s coming from AARP, a well known business. If you hover your cursor over the text “AARP Memberships” a window pops up showing the actual email address (highlighted in the picture) the email was sent from. If the text after the @ symbol in the email address isn’t “aarp.org”, I know the email is probably not from AARP. In this case, Google has already identified this as spam and placed it in my Junk folder. However, if you check the box next to the star, then click the “Report Spam” button, Google will place emails from this email address on their spam list and will eventually blacklist them so they can’t send any more emails. If you’re not sure about an email, or would like more information, please contact us so we can help you and answer your questions.